Reading this in your email? For a better view of the blog – click here! 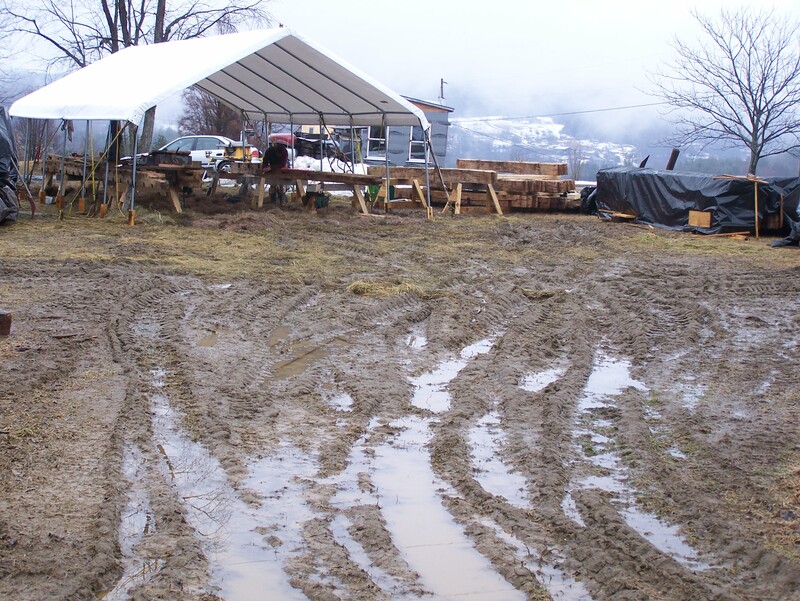 Mud Season – the bitter/sweet time of year. While the temperatures have at long last inched their way above the zero mark, here in rural Vermont the ground is still solid. Timber framing in the famous mud of New England’s spring beats the challenge of working in snow squalls and sub-zero temps, but it’s still not for the faint of heart! Sure, our winter coats and work gloves have been shed but now we must muddle through our work area. As more snow melts, the damp ground slowly releases the grip of winter, churning out a soft, murky surface under our feet that you can sink into up to the ankles. Construction continues nonetheless, so we throw down a carpet of hay to make the work area easier to traverse. There is, of course, a wonderful silver lining. Not only is old man winter behind us, but best of all, mud season means the maple sap is flowing! Cold nights and warm days bring the sweetness of spring. This entry was posted in Barn Raising, Green Mountain Timber Frames, Middletown Springs, Timber Frame Projects and tagged barn frames, barn restoration, colonial construction, custom barn home, old barns vermont, restored barn frames, vermont architecture, vermont construction, vermont timberframe by Green Mountain Timber Frames. Bookmark the permalink.